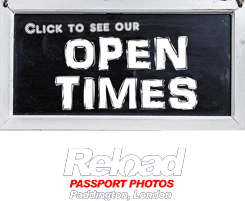 If you are looking to get your Algerian passport photo or your Algerian visa photo snapped and printed in London then Reload Internet in Paddington is the place to come. We are open every day of the week from early in the morning until late at night, even on a Sunday! We are the most reliable and convenient passport photo studio in London for you to have your Algerian passport photo or visa photo taken at. Our Passport photo centre is conveniently located in London and we are able to provide you with 6 passport photos for only £9.99. Our service guarantees that the Algerian passport photos we supply will meet the Algerian Passport & Visa photo requirement or we will retake your Algerian passport or visa photo completely free of charge. Why choose Reload Internet for your Passport photos? 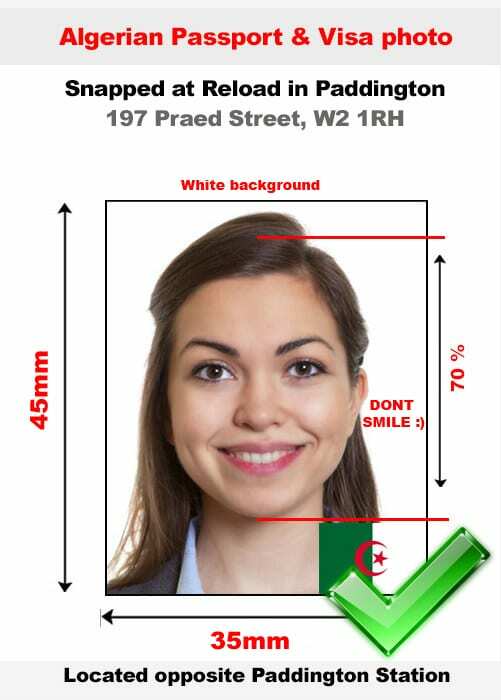 In order to snap your passport photograph to the specifications required by the Algerian Embassy, you can be assured that we have all of the professional equipment in-store that is required to give you the Algerian Passport or visa photograph within 10 minutes with no appointment needed. We know that the requirements for each of the Countries worldwide are different, and because of this we have all of the Embassy guidelines available to hand. This ensures that all of the passport photos we produced are 100% approved first time around. Applicant must make sure the photo is clear, well-defined and taken against a light-coloured or a white background. If you’re submitting a digital version of the photograph, make sure it is not altered in any way. You must face towards the camera with a neutral expression, neither frowning nor smiling, and with your mouth closed. Applicant may wear non-shaded or shaded prescription glasses as long as your eyes are clearly visible through the lenses. You must make sure that the frame does not cover any part of your eyes. Sunglasses are strictly not acceptable. Accessories like hairpiece or other cosmetic accessories are acceptable if it does not disguise your normal appearance. If the applicant must wear head covering for religious reasons, make sure your full facial features are not obscured. Photos applicants submit must show the full front view of the head, with the face in the middle of the photo including the shoulders. Parents must make sure that child is on their own in the picture. Babies must not be holding dummies or toys. Children under the age of six do not have to look directly at the camera or have a neutral expression. Babies under the age of one do not have to have their eyes open. Parents can support their heads with their hands but hands must not be visible in the photo. We are always updating our specifications in regards to Algerian passport and visa photos in accordance with the guidelines released by the official Consulate of Algeria, which can be found here.